Kilimanjaro is an incredibly popular climb, far more so than any other trek we know of. With so many people climbing it is not surprising that trekkers are likely to encounter crowds, busy camp-sites, sanitary issues and litter. But exactly how bad is it? Don’t come to Kilimanjaro expecting mountain wilderness. Come expecting human theatre on a grand scale instead. The odds of having a trail to yourself are small. Kilimanjaro is incredibly popular and as with the high porter – trekker ratio you end up with a lot of people on the trail. 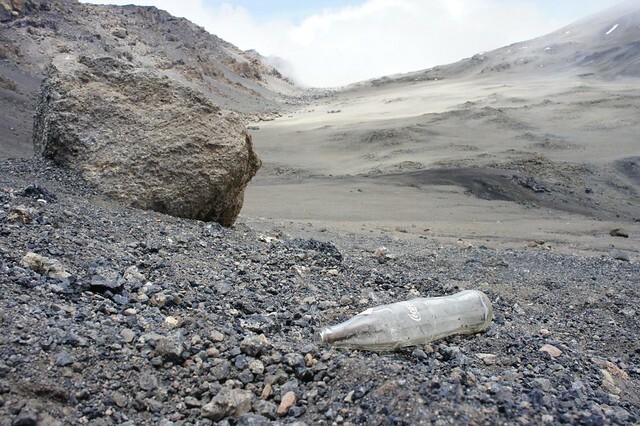 I wouldn’t go as far as to say that Kili has a litter problem, but the poor form displayed by some trekkers and porters alike in disposing their litter along the way can be depressing. Park wardens do maintain and tidy the trail, but discarded grain alcohol sachets, hand warmers and even bottles of coke were ever present. One bright biped had discarded a series of a half dozen hand warmers along the climb to Stella Point. It is lazy, retarded and infuriating. So if you are reading this and planning on climbing Kili, please take any litter back down with you. Take a small sandwich bag to keep it separate from your main gear. How hard can that be? There are ways to avoid the crowds. Trekking out of season, particularly in the rainy months is a great start. The other solid option is to choose one of the quieter routes. TK Rongai and TK Lemosho are fantastic routes in their own right and avoid the crowds that are guaranteed on Machame. To be fair, even on a busy day Machame isn’t too bad. There are sections (particularly on day 2) when you can expect a single file stream of trekkers, but there are plenty of other sections where you won’t see anyone else for up to an hour. The camp-sites are large but mostly cope admirably with the volumes of people abluting themselves. The summit itself can get very busy and with super cold temperatures you don’t want to be hanging around waiting for your turn for a photograph. Summiting in the day can be an excellent alternative with far fewer people around.